KBTalking Brown switch with cross style stem. Similar to Brown Cherry MX in function and feel. Really smooth, enjoy typing again! not a bad over all switch. little stiffer then Cherry MX browns with more defined bump, though not as smooth over all. Still a good all around switch though. 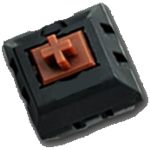 Have experience using KBT Brown switches? Add a review to share your knowledge with the keyboard community.